Welcome to DEE-BEE Printing. 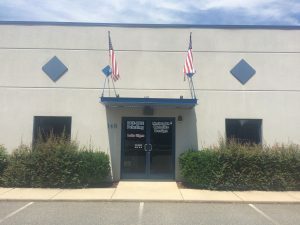 We have been serving local businesses for over 20 years in the Iredell County Area and are conveniently located just off Highway 150, near Perth Road, in Mooresville, NC. We specialize in PC based printing because most small businesses use PC’s. We can also print Mac files.As a PC based printer, we can handle most PC file types. Our specialty is Microsoft Office. We can print all your Word, Publisher, Excel, Power Point and other Microsoft files. We also have a full suite of Adobe Products including Illustrator, Photoshop, Fireworks, Acrobat and more. If you have files in other programs, just give us a call at 704-663-6036. You may need to save it in a different format than the usual. Do you need your print project set up? Bring whatever you have to work with even if it’s just a note on a napkin or a thought in your mind. We can set up your print project for you. If you need Color Copies, no problem as we have several print options. Need NCR forms? We do that as well, 2, 3 or 4 parts. Business cards are a large part of our business and we can print yours fast in-house. 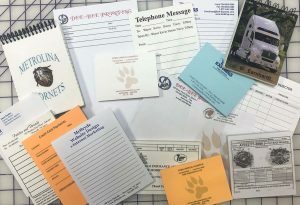 Note Pads are a GREAT way to get your name in front of potential customers. Come see us for our free note pads and have us print custom note pads for you. No matter what you need, if it’s print on paper, give us a call and we will do our best to make you look good. Most of our products are printed in-house, not outsourced. Preferring to keep things in-house allows us to have better quality control and quicker turn around times. A few items we do outsource are Post-It Notes and business cards with raised print (thermography). Our source for Post-It Notes has a large selection of pad sizes and paper and ink colors. They can be printed in 1, 2, 3 colors or in full color. The options are almost endless. Our source for these has quick turnaround times and a host of options. Our in-house printing allows us to provide quicker service with more options. Give DEE-BEE Printing a call: 704-663-6036 and let us make you look good!